Jorhat witnessed hectic activity on 72nd Independence Day, an indication that those fear-ridden days of complete shutdown in the State as a result of threats, bandh calls and terror tactics by militant organizations, were things of the past. Assam Power Minister Tapan Gogoi while unfurling the tricolour in the main function at the Court Field here, recalled the contribution of freedom fighters of Jorhat to the freedom struggle and its rich heritage. He further announced that all open electrical wires would be replaced by aerial bundled cables to prevent theft of power and safety to consumers. Dikh, an organization involved in sociology cultural activities organised Ride to Freedom, a cycle rally which wended its way from the Rajmao pukhuri to Cinnamara through Baghchung, Jail Road and back to the historic pond. Gaurav Borthakur, president of Dikh said that due to the rain, the number of participants were less but good enough at 75. 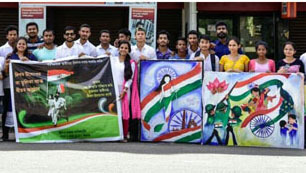 Later a programme was held at Baruah Chariali where patriotic songs were sung and on the spot drawing on canvas of themes related to India’s independence were presented. 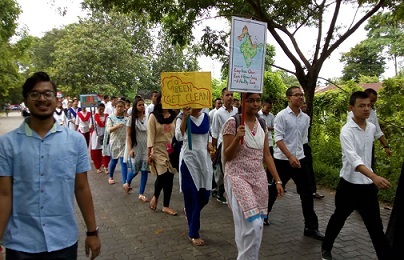 As part of the Day, the NSS of Assam Agricultural University took out a Swachhata awareness rally which was flagged off by Vice chancellor KM Bujarbaruah. At the Gonesh Gogoi Kabita Kanan Park, the tricolour was unfurled and homage was paid to Harijan Bandhu and freedom fighter Krishna Sarma. Smriti Goyal cinema hall screened Parmanu free of cost for schoolchildren. Late in the evening, the Jorhat Theatre Hall organised patriotic song programmes, Maatir Gaan and Swadhinatar Gaan and staged a short play, Joymoti. Minister Gogoi said that the BJP-led Government was committed to implementing all the schemes of the Centre and State Government and especially making the State defecation-free by constructing toilets in each and every house in the villages and towns. On the occasion, two doctors, senior surgeon Dr Hadagar Deuri and Dr Madhab Handique were felicitated with citations for exemplary work by the minister. As per information, Dr Deuri donates from his salary every month for the welfare and medical treatment of poor patients. 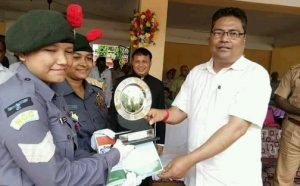 Hemalata Handique Memorial Institute, one of the first English medium schools in Upper Assam, won the award for best march past.